Why are replacement globes important to use? Bug Zappers have special UV globes designed to emit specific light wavelengths to attract flying insects. This UV light is safe to use around your family and pets. Make sure your bug zapper is attracting flying insects by replacing it with the same globe wattage. Keep your product weatheproof by using original Yard Guard Globes. UV lamps lose their brightness over time, we suggest replacing your globe annually or as soon as light output is reduced. If you know the your Bug Zapper name or globe catalogue number, enter it into the search or click on the links below to help you find the globe you need. 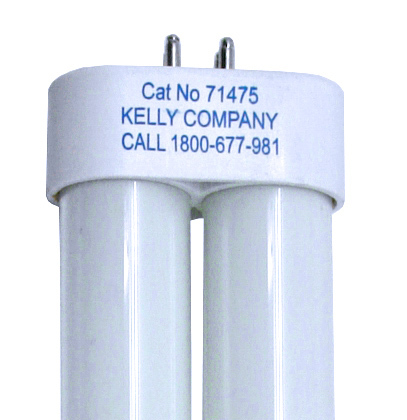 Electronic Bug Killers, Electronic Bug Zappers, Bug Killers, Bug Zappers, Flying Insect Traps, Insect Traps, Mozzie Zappers, Electrical Discharge Insect System are the many names given to the Electronic Insect Control products manufactured by The Kelly Company. These devices attract and kill flying insects. The insects are attracted by a light source to an electrically charged grid where they are electrocuted by touching 2 wires with high voltage. The light source used to attract the flying insects are commonly called a UV Black Light, UV Light, Black Light, Insect Globe, Insect Attracting Globe, UV Globe, Black Light Globe, Bug Zapper Globe, Bug Killer Globe, Zapper Globe. The original globe was custom designed and manufactured by The Kelly Company to emit a specific wavelength that provides the greatest attraction to flying insects. Replacing it with the same globe will ensure maximum performance of your bug zapper.